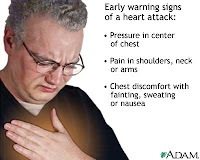 "Heart attacks - God's revenge for eating his little animal friends"
According to Women's Health Magazine, the fourth Warning Sign that should not be ignored is passing chest pain. Now I could have sworn I had already written about heart attacks but could not find it in my blog. So here goes. While the heart is a powerful muscle, it has NO pain nerves. There is no direct feedback that something is seriously wrong (other than the classic instant death heart attack). Most heart attacks start slowly, with mild pain or discomfort. People affected aren't sure what's wrong and wait too long before getting help. We need to recognize a heart attack though its secondary side effects within the first 5 minutes! If you experience the symptoms above call 9-1-1. Even if you're not sure, call 9-1-1. An EMT can begin treatment when they arrive — up to an hour sooner than driving yourself to a hospital. Your doctor will do an EKG to determine whether your heart has been damaged, and then decide on the best response; false alarm, prescribe clot-attacking drugs, or perform surgery to clear your arteries.